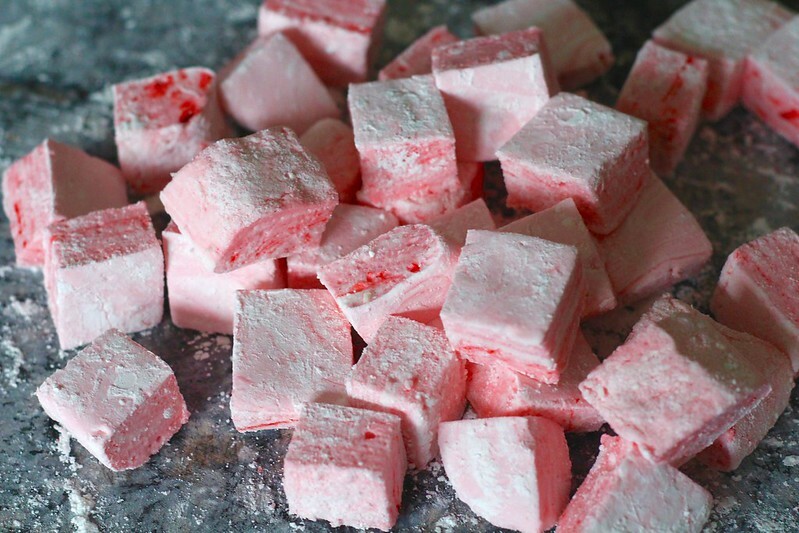 So, remember when I made vanilla bean marshmallows a few weeks back? Well, I loved them so much, I ended up using them all between hot cocoa and a fabulous recipe coming your way soon, that I decided I needed to make more. This time, however, I decided to make half the batch vanilla bean, and the other half peppermint. 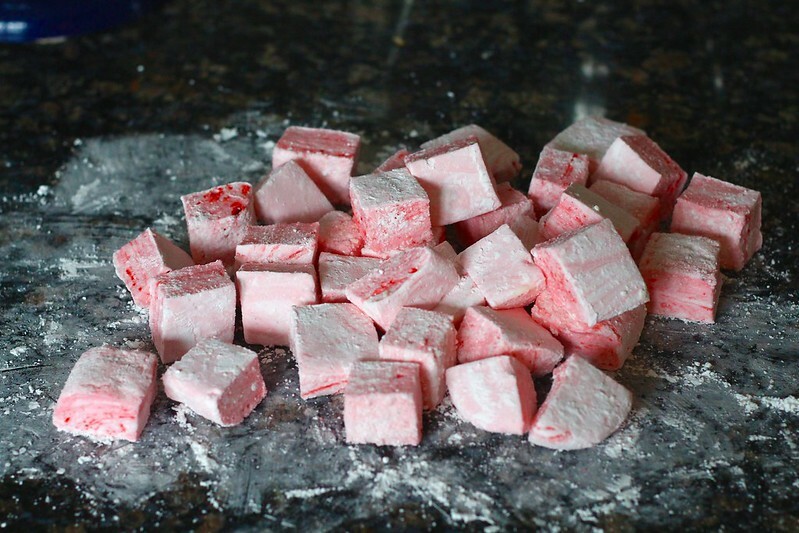 If you have been a regular follower of my blog for a while, you will know that I absolutely adore peppermint. It's one flavor I look forward to all year to make during the holiday season. My kids were particularly excited as well. 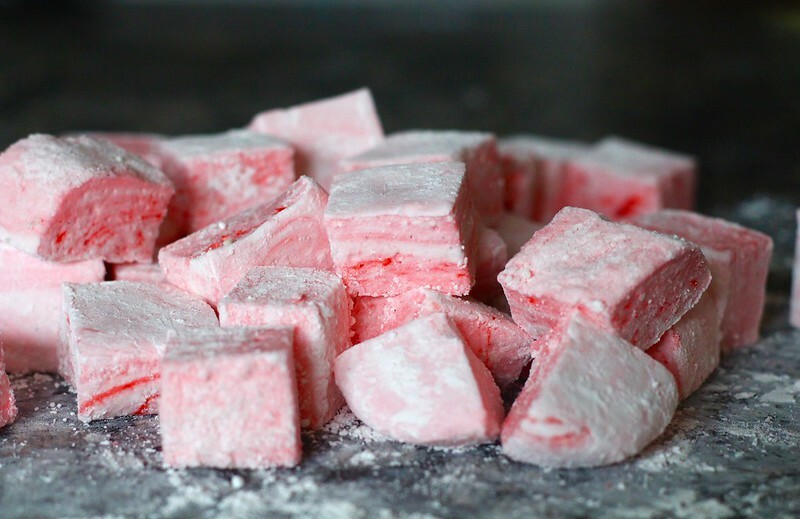 These marshmallows are so worth making. My husband asked me why not just go buy the couple dollar bag at the store since that seems so much easier. I had to do a double take and my mouth opened with pure disbelief. What the heck is he thinking!? And doesn't he realize who he's talking to? Of course it's easier to buy them at the store, but the homemade version is a million times better. That is almost always the case when you make something at home. But, since I think you get my point, you need to go make these. I had hot cocoa the other day with one of these bad boys in it, and my hot cocoa went from great to amazing. And this is coming from a person who could take or leave store bought marshmallows. You may just want to eat these on their own. I won't judge. Place 1/2 cup of the water in the bowl of a stand mixer fitted with the whisk attachment. Sprinkle the gelatin over the surface to soften. Meanwhile, in a small saucepan with a candy thermometer attached, combine the remaining 1/2 cup water, sugar, corn syrup, and salt. Cook over medium heat until the mixture reaches 240˚F. Immediately remove the pan from the heat. Meanwhile, combine the confectioners’ sugar and cornstarch in a bowl and whisk to blend. Lightly grease a 9 x 13-inch baking pan. Coat the bottom and sides of the pan well with a dusting of the sugar-cornstarch mixture, saving the rest. Remove the marshmallow slab to a cutting board. Cut into desired shape with a pizza cutter or cookie cutter (dip in the sugar mixture as needed to prevent sticking.) Add the marshmallows to a bowl with the remaining sugar mixture and toss to coat and prevent them from sticking together. Store in a sealed jar or container.